Most cameras and smartphones use raw image format so that there is minimal processing to the photos taken using that device. The raw image format is very different from your regular image formats like JPG and PNG. Windows File Explorer natively supports preview for several different file types. However, up until now, there is no support for raw image formats. Which simply means that you cannot preview raw images or open raw image files on Windows 10 using the built-in Photos app. If you are a photographer or someone who works a lot with the raw image file types, then it can be quite inconvenient to not be able to see a preview in the file explorer or to open it without installing some third-party software. That changes with the addition of Raw Image Extension by Microsoft. 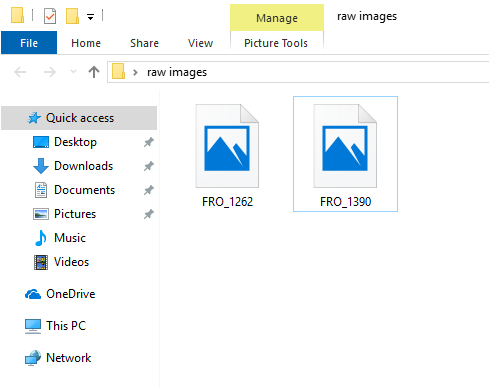 By installing the raw image extension from Windows Store, you can now preview Raw Images in File Explorer and open raw images on Windows 10 with Photos app. To preview and open raw images on Windows 10, you need to install the Raw Image Extension from Windows Store. The extension is completely free. That being said, to use the Raw Image extension, you need to be on Windows 10 version 1903 or using Windows 10 insider build 18323 or higher. So, confirm your Windows 10 version number before proceeding. Once you've confirmed, follow the below steps to preview and open raw images natively on Windows 10. Click here to go to the official Microsoft raw image extension page. Click on the "Get" button. Microsoft store will open automatically. If your browser prompts, select "Open Microsoft Store" option. Click on the "Get" and then "Install" button. The above action will install the Raw Image Extension on Windows 10. That is it. You don't have to do anything else. After installing the extension, File Explorer will start showing the previews of raw images. By double-clicking on the raw image file, you can open it in the Photos app. If you like this article, you might want to check out the best Windows store app list and how to pin any settings app page to start menu and how to disable Cortana on Windows 10 to protect your privacy.